Live! Love! Do stupid things! Gabriel Bota shares with us his thoughts about Surrealism, creativity, and the most beautiful thing in his life: the people. He wears a black t-shirt, personalized with the message #citesc deci #rezist (#IRead therefore #IResist). 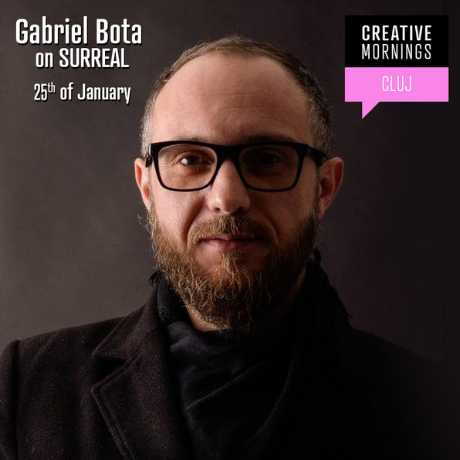 At the first edition of CreativeMornings Cluj in 2019, the poet Gabriel Bota (Gabi, for everyone) shares with us his thoughts about Surrealism, creativity, and the most beautiful thing in his life: the people. Former salesman, current homeowners association chairman, passionate advocate for reading (from books, not on the Internet! ), Gabriel confesses that he was never a realist. The realists are the people who name the things with their own names. The creative people, however, are the ones who consciously and constantly train their brains not to tell them what to do. In a cacophony of giggles and words, we do, for 30 seconds, the liberating exercise of naming five objects inside the room with other words. “Shower”, firmly points a nearby attendee to the red fire extinguisher against the wall. It is an exercise that we can resume whenever we feel the need to refresh our creative energy. Today’s surrealism is to live our own reality. Space probes that left the solar system? The third gender? Domestic governments? According to André Breton’s standards, the co-founder of the current, we live in a surreal world, but in which, paradoxically, surrealism loses its essence. Gabriel Bota is a man who loves paradoxes and weaves them with natural skill in his speech. “All that we have in common are the differences between us”, and only through each other we can reach our best version. Article written by Maria Revnic. Explore more in this talk which will have English subtitles soon. Gabriel is a writer and organizer of cultural events, he is a poet who not only writes poetry but lives it through his activities. Even though he studied philosophy in university, for many years he gained a vast experience in management by working for big companies. With this background and the right people around him, in 2013 he co-founded the Transylvania International Book festival - a complex international event which has at its core the art of the written word and reunites book lovers within a vast cultural framework. A festival that makes reading more attractive and accessible to anybody. In recent years, he chose to dedicate his time to two of his biggest passions: reading and cycling. In 2017, he finished a bold project: Read&Ride. 40 days, cycling almost 4000 km around Europe, reading 10 books in 10 countries. It seemed like a simple idea - considered by many to be too crazy - but in the end it became a spark that lit up the desire for reading and sports, inspiring thousands of people he met during his journey, but also the others who have followed his virtual journal. From stories made or encountered through his incredible journeys (Read&Ride project, North pole and so on), his poetry and writings, Gabriel recognizes a sense of the surreal in unexpected moments, feelings and people.